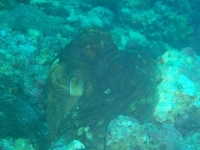 The most frequently spotted octopus in the Western Pacific, as well as the largest. 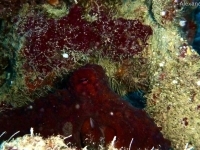 The extensions of the arms are dark brown, there is an eye-spot on the mantle just below the eye, the pupil of the eye is a horizontal stripe and there are neatly arranged rows of white spots on the arms. 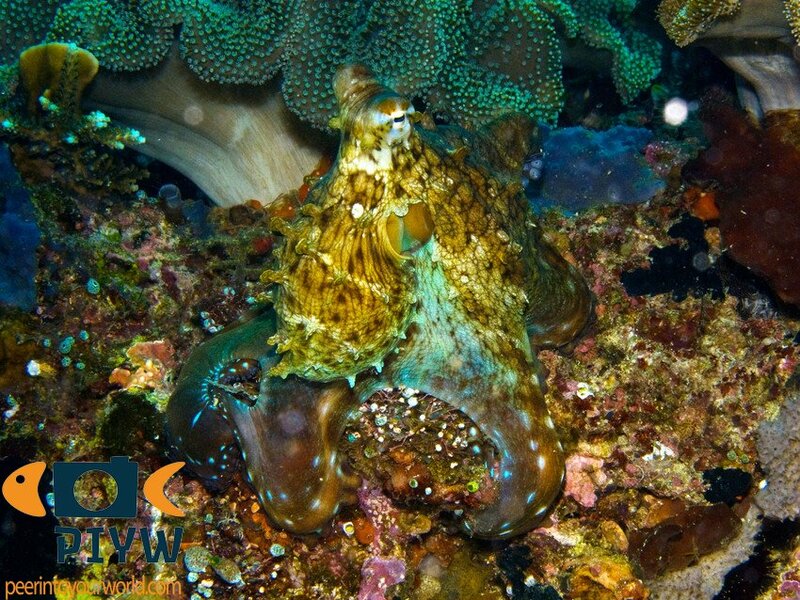 Since octopus can change their color and skin texture, there is an enormous variety of different appearances it can show you. Their dens can be spotted by multiple empty crustacean and mollusk shells just outside the entrance. Unassessed by the IUCN Red list, but a common species in the Western Pacific with an even wider distribution. Indian Ocean and the Pacific; from the East African coast to the Hawaiian islands. 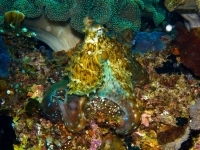 They prefer broken reef terrain with caves or crevices to hide, in a depth range of 0-60 meters. Males put up displays to attract females for mating. 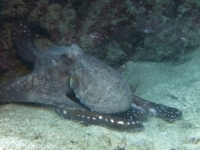 The male octopus holds down the female while he inserts a special reproductive arm (hectocotylus) into the mantle of the female, where it releases the sperm. Males and females often die shortly after mating. 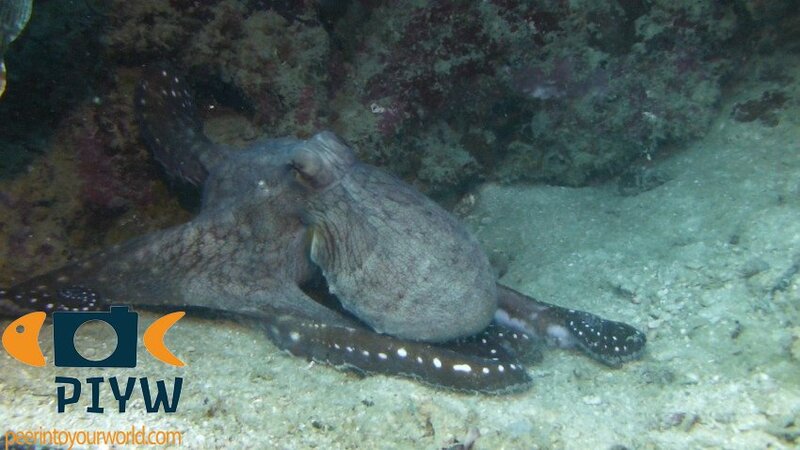 Young octopus spend some time as plankton before settling to the bottom to begin their benthic stage. 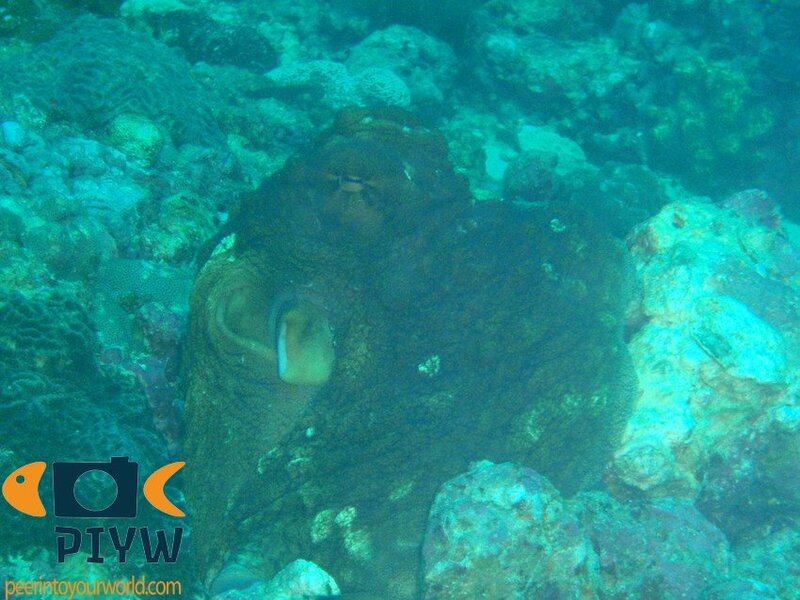 They feed on bivalves, mollusks and crabs. 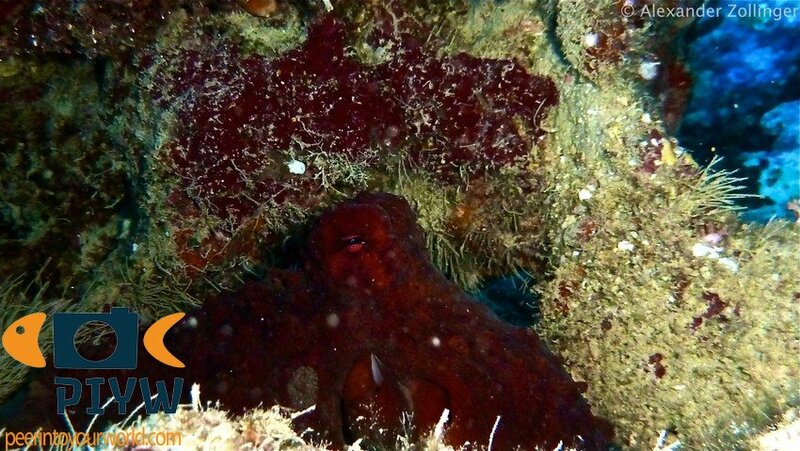 Despite their size, these octopus will often flee when approached, or try to confuse you with rapid changing color displays and skin texture changes. The change is remarkably quick and very impressive. When it feels threatened, it will release a cloud of ink to confuse its ambusher and take off quickly. This however causes high levels of stress, and could even kill the animal when it has to be done repeatedly.